The Iranian film Kandahar (Mohsen Makhmalbaf, 2001) ends at the point where we might otherwise have expected it to begin, with Nafas (Niloufar Pazira) peering through the veil of her burka to the walls of the city she has travelled to from her exile in Canada, seeking her sister who has promised in a letter that she will suicide with the next eclipse. At the end of the Australian film Beneath Clouds (Ivan Sen, 2002), the teenage Lena (Dannielle Hall), who has hitchhiked from the outback to find her estranged father, is on a train entering the great urban sprawl of western Sydney. The fates of both these women, of course, are subject to whatever our viewer’s imagination wishes to make of them. Though the future for a teenage Indigenous woman alone in Australia’s largest city might not seem very hopeful, Lena’s toughness (which in itself owes much to Hall’s performance) suggests that though the aim of her search will prove disappointing – finding her “missing” Irish father – she will somehow manage to survive. Nafas’ fate, however, confounds us. Made before the United States of America declared war on Afghanistan, and made by Makhmalbaf in order to bring attention to the plight of Afghanis under the rule of the Taliban, it is near impossible to imagine a utopian closure of ‘freedom’ attached to the sisters’ story. It is a testament to the film’s power that however despairing our conclusions, the Afghanis are given flesh and history and life. We see through the burka: not at it, not underneath it, but through it. When the New York City World Trade Centre was bombed in 2001, the editorial of the British film magazine, Sight and Sound, stated that a historic rupture had occurred. It announced the death of irony and suggested that this was also the end of complacency in filmmaking. Less than a year on, Spiderman (Sam Raimi, 2002) rakes up big at the box-office, George Lucas is urging us to stop worrying and delight in being clones, and the most feverish analysis I’ve read in the Australian media about our film industry in the last year – both digital and print – had to do with how many Australians got nominated for an Oscar. The market is apparently safe. There is no stop for irony on the roads that both Nafas and Lena take. Kandahar drops us immediately into the refugee camps that exist along the borders of Iran and Afghanistan. Though post-revolutionary Iranian cinema is often written about as if all Iranian filmmakers are playing games with the nature of reality and fiction, there is a vast difference between the existential philosophical investigations of Kiarostami and the more directly political investigation of truth and cinema of Makhmalbaf. In both Salaam Cinema (1995) and Moment of Innocence (1996), Makhmalbaf’s use of ‘real people’ and ‘real time’ formed an intricate shadow play of illusion in which history became the central character. It has always struck me that there is a playfulness to Makhmalbaf’s work that resides in his pleasure in the games film makes possible. Moment of Innocence, a film about historic legacy and generational perspective, and which for the most part is an argument between a former activist and his gaoler, manages to suffuse the present and the future (represented by the young actors who mimic the adults’ past) with optimism and hope. There is precious little lightness in Kandahar. As if the immensity of the subject overwhelmed the director, there are scenes that seem clumsy and inept, fragments of exposition that go clunk. The dubbing on the soundtrack is a mess. But for all the narrative confusion, the technical problems and the discordant sound, Kandahar emerges as a deeply affecting and powerful work. It is certainly not a documentary but its most powerful sequences occur when Nafas recedes into the background and we see the everyday lives of the people she meets along the way. Iranian workers with refugees explain to Afghani girls returning to their homeland that they will not be able to study and that they should not pick up dolls on the road for they trigger off landmines. A small boy tries valiantly to learn recitation of the Qu’ran in a village madrassa (religious school), as a life of the scholar is his only hope of escaping a life of destitution. An African-American revolutionary becomes a village doctor even though he has no medical skills for there is a desperate need for health workers. And in the film’s most controversial scenes, victims of landmines hop crazily on their crutches to meet artificial limbs being parachuted down to them from the sky. This last scene has provoked discussion relating to its execution and meaning since overall it takes place within an aesthetic of documentary realism that convinces us that what we are watching being enacted is ‘real’, is ‘truth’ (1) When we first see an artificial limb descend in slow motion at the beginning of the film, the image has a grand operatic terror to it. But Kandahar is not a documentary and, it strikes me, that if the film has any antecedent it is Michelangelo Antonioni’s Zabriskie Point (1970), an earlier road movie in which the characters too receded in the narrative whilst the director created a series of expressionistic and vivid tableaux that commented on, and finally indicted, the culture of the USA. But whereas Antonioni’s film remained detached and abstract, there can be no such detachment for Makhmalbaf. How do you give voice to the humanist outrage experienced when confronting a nation existing in war for over 20 years? How do you create images that can in anyway express the horror of women being thrown into pre-modern servitude and slavery? Kandahar suggests that one way is to create a documentary of nightmares. If it was simply a catalogue of horror, I doubt that Makhmalbaf’s film would be as emotionally resonant as it is. There is also a fierce intellect at work in Kandahar, a subtle dialogue about war and the economy of war. The burka becomes one of the potent symbols of how the oppression of women functions in Afghanistan. Through Nafas’ s journey from Canada to Iran to Kandahar itself, she is constantly negotiating dress, the hedjab and the burka. When she meets the American, Tahib Sahid (Hassan Tantai), their emerging trust is symbolised by her appearing ‘naked’ before him. 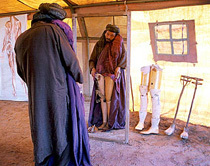 The burka is also at one point taken on by Hayat, a one-armed amputee, who wears it in order to hide from the Taliban. In this instance the wearing of the burka is subverted to suggest that this most potent symbol of oppression can also be a tool of defiance and escape. Certainly it provides Nafas ‘cover’ to defy the Taliban and to proceed on her journey to rescue her sister. But it is in a refugee camp that the complicated meanings attached to the wearing of the ‘religious’ dress are most evident. Two European doctors, both women, have the task of delegating artificial limbs to amputees. These European women perform their medical tasks uncovered and wearing professional medical white coats. 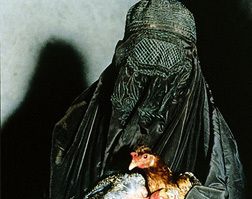 Nafas, speaking to them in English, re-arranging her burka, is caught between the desire to identify herself with these women and the knowledge that to do so would make her a target in her own homeland. The scene at the Red Cross camp also brings into sharp focus the theme of exchange, which propels the narrative of Kandahar. In this war-ravaged state, the economy itself has been thrown back into pre-modernity. The amputees barter and haggle over limbs, as if these plastic and metal attachments are a form of currency. It is this concrete fact, this reality, which gives the parachuting artificial limbs, the madly scurrying amputees, its terrifying metaphoric power. All along her journey, Nafas bribes Afghanis with foreign dollars in order to get their assistance. Whatever the moral worth of her quest – the desire to ‘liberate’ her sister – Nafas’s bribes also force her accomplices to face death from the Taliban. Only Tahib Sahid, who is really a North American like herself, assists her with no money being exchanged. The scene that has stayed with me from this movie, that refuses to go away, is one in which a man attempting to haggle for a more appropriate artificial limb for his wife, fondles an empty burka before a mirror, imagines what his wife would look like with her new leg. This scene asks us to contemplate how the everyday life of humans – in our need to love, to survive, to communicate – functions in the most extreme of situations. It is also a scene I want to recall every time I hear another Western critic argue that it was the bombing of two North American towers which reminded ‘the world’ that there is no end to history. Ivan Sen’s Beneath Clouds is also a road movie in which the narrative is propelled by the encounters Lena has along her way to Sydney. The most important is her meeting Vaughn (Damian Pitt), who has escaped prison in order to go see his dying mother. Though both are Aborigine, Vaughn assumes that Lena is European. Their journey, from the stark desert outback to the industrial grids of Sydney’s west, involves various encounters with both Indigenous and European Australians. Throughout their journey, the presence of the police is constant. If Kandahar is full of the evidence of what war has done to the landscape of Afghanistan, the vast and harsh beauty of the Australian landscape hides a history of colonial devastation. I hope that the attention given to Beneath Clouds since its winning of two awards at the recent Berlin International Film Festival means that Sen’s earlier short film, Tears (1998), will find increased distribution as I think Tears is bloody brilliant. Tears also deals with a road trip undertaken by two Aboriginal youths, but the girl and the boy in the short film are friends not strangers. I think there is no doubt that Sen is a remarkable filmmaker, so in giving expression to my reservations with Beneath Clouds, I’d like to admit that part of it arises from the expectations I had of the film. I want to place it alongside Kandahar not only because I think that both films are unique road movies, but also because a comparison might illuminate some of the problems Australian filmmakers have when it comes to dealing with political and intellectual subjectivity on film. It seems clear that in wanting to address the situation for Afghani refugees, Makhmalbaf was prepared to risk the seamless structure of his earlier films. There are scenes in Kandahar that are simply incompetent, in particular Nafas’s descent into Afghanistan by helicopter and her conversation with the two Red Cross doctors. In part, this may have to do with the inadequate lip-syncing on the soundtrack and, in part, due to the difficulties filming on a border ravaged by war. But not all the clumsiness is due to technical limitations. The script itself is confusing at times; we wonder where we are and what is happening (the Taliban’s search of the women near the end of the film, for example). There are also attempts at hallucinatory imagery that don’t come off and dilute the power of the film. I am thinking in particular of the amputated men running in slow-motion towards a sky filled with parachuting limbs. What proved powerful when we first glimpsed it seems less so when we watch it again. I found myself wondering about the agony the men were experiencing. But I realised neither narrative coherence nor faultless mise en scène were important to my response to the film, nor to the questions and emotions it was attempting to raise. As I hope I have made clear, there is a ferocious intelligence at work in Kandahar that mediates between our emotional responses to the nightmarish imagery and our inevitable feelings of despair. The film is not a horror show, though God knows, the recent history of Afghanistan and the plight of its refugees would make such a response viable. But Makhmalbaf is asking for more; he’s asking us to think, analyse, respond. No one talks much in Beneath Clouds, and when they do, it’s in monosyllables. For this silence to work, for meaning to emerge from within these largely silent characters framed against the immense canvases of the Australian landscape, we have to rely on the nuances that actors bring to their roles and we have to rely on our intellect and our imaginations to fill the silence. But the damn obtrusive soundtrack keeps getting in the way. Tears managed to be eloquent with silence but it seems to me that Sen hasn’t trusted his instincts in his feature length work. In the short film, I had no problem believing the relationship between the youths but there is no subsequent development to Lena and Vaughn’s relationship over the 90-minute running time. Whereas Nafas’ journey introduces us to characters and situations that illuminate the disintegration of culture and society wreaked by war, Lena and Vaughn’s encounters with strangers seem almost perfunctory. There is intelligence at work here but after a while I wanted someone to talk, to articulate, and to argue. I can accept the conceit that Vaughn does not recognise Lena’s Aboriginality but precious little is done to illuminate the meanings in this mis-recognition. In a pivotal scene, the two hitchers find shelter in an old Church. Vaughn starts a fire by ripping up a Bible. The point is clear. It’s a trashing of European religion that mirrors the desecration Europeans have wrought on Aboriginal culture, as well as a defiant opposition to Christianity’s role in tearing apart Aboriginal families and communities. But Lena’s hesitation at Vaughn’s action is once more largely mute. Even more disturbingly, Vaughn’s actions communicate a violence and a political self-consciousness that rings hollow. The tearing up of the Bible placates a secular audience. The very casualness of the act mitigates against a comprehension that Christianity also fucked with the souls of the cultures it colonised. In Tears the presence of the police cars were sinister but silent. At the climax of Beneath Clouds, three young Aboriginal men have picked up Lena and Vaughn. An old woman sits in the back of the car and she is the one who points out a site of massacre. Sen’s camera surveys the craggy cliffs on top of which the massacre occurred. It is also this old woman who indicates to Vaughn that Lena too is Aboriginal. The car is intercepted by police. The old woman’s bowed head, her desire to disappear from the coppers’ sight speaks volumes for the relationship between herself and the white representatives of the Australian State. But the film lurches into some uncomfortable violence, a battle between the Aboriginal youth and the white police that seems to me, at least, melodramatic. The violence may be satisfying on a visceral level, an enactment of revenge, but it has no power, as the police are one-dimensional caricatures. It’s pandering to the audience and with all this frenetic activity I lost the emotional weight of what it meant for Vaughn to find his mother gone, presumably to have died. After seeing Beneath Clouds, I entered a foyer where a crowd of people were talking about it in its relationship to Australian film. It’s obvious, of course, that given the fractured relationship between white and black Australians, Beneath Clouds has to be read politically. It is equally obvious that this is part of the filmmaker’s intention. But unlike Kandahar, where linear narrative will be sacrificed in order to illuminate history, Beneath Clouds refuses to ever challenge the conservative linearity of its storyline. I emerged from the film detached and unmoved, in part of course, because of weaknesses in the script and inadequacies in performance, but also because of the filmmaker’s failure to trust the emerging relationship between the youth. In the end, precious little is communicated and the reconciliation on a station platform between Lena and Vaughn seems forced and a convenient closure. I understood why Makhmalbaf did not enter Kandahar with Nafas, why the film ended at the city’s border. Nafas’s journey allows our imagination to comprehend the horror of that city’s fortress, both literally and metaphorically. But there’s so much more to learn about Lena and Vaughn, and in particular, what is it that they must now say to one another. The audience talking about Beneath Clouds in the foyer were very respectful about how ‘beautiful’ the film was. No one was shocked, confronted or disturbed. Is it unfair to wonder if the brutality of the Australian landscape deserves something more? At the beginning of Beneath Clouds, Lena is dwarfed by the blighted rural grandeur. She remains so right at the end of the film, and nothing she has seen or encountered along the way changes this reality. The initial power of the rural imagery does not last long. It becomes pretty pictures and we fail to see the horror and history in the landscape. Silence and anti-intellectualism might indeed be ingrained Australian traits. But just as the burka hides and makes Nafas invisible, the lack of words and the lack of action, renders Lena mute. This brave young girl deserves something more. Manohla Dargis in her review of Kandahar in the LA Weekly, Jan 11 2002, makes some interesting observations not only on the metaphoric meaning of this scene, but also on some of the issues arising from Westerners looking and comprehending Iranian cinema and culture. Kent Jones in the Jan/Feb 2002 issue of Film Comment also makes a cogent defense of this scene. I should also note that more recently Western media reports have focussed on the controversy that the actor Hassan Tantai is a fugitive from the USA, wanted in connection with a murder of an Iranian activist.